While there are many similar-sounding options that share similar end goals, the techniques, side effects and recovery time involved in each are wide-ranging. It’s important to research and select the technique that is right for your individual goals and expectations. Two of the most popular non-invasive body sculpting techniques available on the market today, CoolSculpting® and SculpSure® possess similarities, but also some key differences that are worth being aware of if you are considering non-surgical ways to slim down. CoolSculpting is a non-surgical body sculpting procedure that uses cold temperatures to kill fat cells. The CoolSculpting technique uses controlled cooling which freezes and crystallizes fat without damaging the surrounding skin. During a CoolSculpting treatment, skin and fat in the specified treatment area are sucked up into an applicator that contains cold plates, one on each side, which apply controlled, cold temperatures. After an hour of CoolSculpting treatment, the plates and suction are removed, and the body’s lymphatic system goes to work removing the destroyed fat cells. While the fat and the skin go back to their normal position, nerves in the skin are also affected temporarily, which may cause numbness for several weeks or months following the procedure. During that time, some discomfort may be experienced in the treated areas. On rare occasions, some patients who reviewed CoolSculpting reported that they experienced temporary hardening of the skin. This side effect typically dissipates after the treatment is concluded. 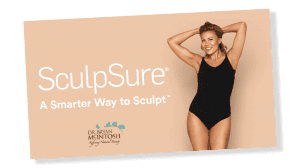 SculpSure is another popular body sculpting procedure that uses a very different technology. While the end goal is the same, SculpSure is a laser-based, FDA approved technique that ruptures fat cells using a warm laser. Similar to CoolSculpting, SculpSure can treat problem areas (typically the waist or abdomen) with different sized and shaped applicators, most of which are around the size of a cell-phone. Instead of chilling the skin and freezing fat cells, SculpSure’s treatment makes things get warm, causing hot and achy discomfort, rather than cold and achy discomfort. Each technique involves a temporary, uncomfortable sensation, but with SculpSure, the treatment time is only 25 minutes—about half as long as CoolSculpting. CoolSculpting and SculpSure have many things in common as fat removal techniques; each are relatively quick compared to surgical options, both typically require multiple treatments to achieve desired results, and each involve some discomfort during the treatment process. However, these treatments begin to differ greatly in more subtle ways, such as treatment time, duration, side effects and recovery time. For instance, a side-by-side comparison demonstrates that each treatment of CoolSculpting is twice as long as a SculpSure treatment, and has more potential side effects, such as hardening, nerve pain and sensitivity. SculpSure, on the other hand, yields similar results in less time—plus the warm discomfort that is typically experienced during the treatment is generally better tolerated than CoolSculpting’s cold discomfort, which can cause patients to become overly chilled. Across the five most common body sculpting options, and certainly when compared to CoolSculpting, SculpSure offers the lowest time investment and least discomfort for the results. With just a 25 minute treatment that presents no lingering discomfort or side effects, SculpSure is the only procedure available where a client can be swimsuit ready the next day.